There is no esports fandom quite like the one that is dedicated to the Gears of War Pro Circuit. They have patented their own signature brand of hype. That’s why I was elated that the entirety of the GOW hype machine was making their way down to New Orleans, a city that can house their level of passion. It seemed like there was a record breaking amount of roster swapping this season, but the truth it has become the norm. It took me a moment to orientate myself with who was now playing with who. My tournament notes were a complete mess. There were so many solid performances this weekend so I guess it all worked out, even if I’m a little cross-eyed. Optic Slaps Another Brick On The Wall I was playing catch up before coming to NOLA and watching what had been going down in the circuit this season. 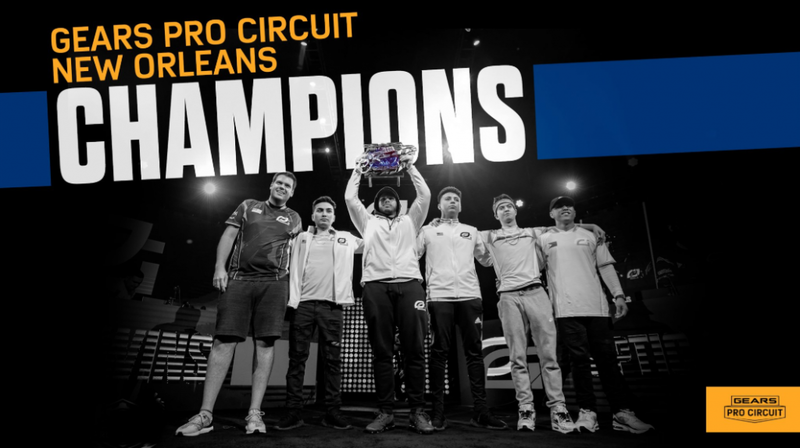 I came to the Big Easy with the understanding that I would most likely see an optic victory, however there were plenty of moments where it was in question. Echo Fox made a noteworthy effort all weekend long to be a thorn in the side of Optic. There were countless moments where I thought the check Icy’s mouth was writing could very well be cashed. These two were going at it hard and it was wildly entertaining. EVERYONE on these two teams were in fine form. There were only a few games where it seemed as though Mental was a little off, but he bounced right back to seal the deal. It honestly felt like he was experimenting with new strategies. As for Echo Fox, strategy was definitely on the front of their minds. Part of what pushed their team to second place was their signature smooth rotations and killer smoke grenade usage. Favorite Series: Elevate v. EU’s Finest While Elevate was perhaps a little shaky in their dealings with EU’s Finest, they managed to hold their own and make some serious moves. Elevate worked hard to play to their strengths and they were able to rally after a very strong start from EU’s. I would say Elevate forced EU’s to pull out some of their fancier tricks. Marsh was making himself quite a nuisance with his evasion capabilities which unfortunately for Elevate, helped disrupt their rotations. In the end EU’s Finest simply had tighter rotations and a more solid grasp on the map. Tip Of My Hat to Ghost Gaming I have to say Ghost Gaming surprised me a lot at this event. I saw a great deal of focus and I could honestly have seen them making it into top three without much of a problem. Alas, they’ll have to settle for 4th for now, but they earned that spot no question. They had several instances of pure momentum going. I think the only slip up from what I saw wasn’t so much technical as it was mental. When they would get stopped short they seemed to have a hard time getting back the same amount of gusto. When they were on, they were playing flawlessly you could see them truly enjoying themselves. This particular event was also host to Halo’s HCS which meant double the fun for me as I made my best effort to cover both. I have to say, as far as which side was having more fun…I respectfully have to give that title to the Gears side of the room. I’ll be curious to see how this all shakes out in San Diego.